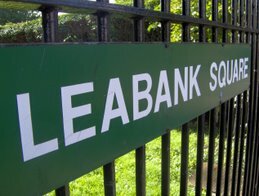 Leabank Square: The Mabley Green Boulder by John Frankland!! ..... but is it ART?! Can you find out when the rockery outside Leabank Square (on the other side of Berkshire Road) is going to be completed? I've seen some of the finnished ones up Well Street and they look great. But we've been staring at that sand-pit for a couple of months now - I'm bored! Hackney Wick, now twinned with Flintstone! Let's chuck another dino on the barbi. I'll be Fred, who wants to be Wilma/ Barney/ Betty anyone? Ok, don't call me Fred, call me a cynic, someone always REAPs the benefits of public funding, in this instance I don't believe it's the locals of Hackney Wick who are the main beneficiaries… but we should have been. Those REAP projects were supposed to be completed by Autumn 2007. I had been considering the possibility of the whole thing sinking into the marsh below,this led to considering the footprint left by this particular lump of rock, and on to the carbon footprint,likely considerably more than Stonehenge.